Small Business, Big Impact | BMT Micro, Inc.
Black Friday is one of the single largest shopping days of the year. Customers wake up at the crack of dawn to ensure that they get the best deals on presents for their loved ones, and might even snag a few things for themselves. For small businesses, Black Friday can seem daunting. How do you keep up with these large corporations? While offering Black Friday deals is a great idea to stay competitive, there is a new holiday on the rise: Small Business Saturday. Small Business Saturday falls the day after Black Friday, and was started to encourage communities to support their local stores. No matter if you want to plan a last-minute sale or start planning for next year, here are some tips and tricks to make the most of the holiday. How did Small Businesses Saturday start? In 2010, American Express created Small Business Saturday to help support the growth of small businesses in their local communities, as well as small ecommerce companies. Many customers enjoy supporting small companies, as they can see the impact directly on their community. Even purchasing through a small company online usually comes with more personal customer service and products. American Express even went so far as to create a helpful guide to help small business create customizable advertising materials, an event planning checklist, event fliers, and ideas of events to take part in. With Black Friday rapidly gaining a reputation for being full of intense shoppers, limited sale items, and and an early start time every year, Small Business Saturday is rising in popularity. How can I get involved in Small Business Saturday? The easiest way to participate in Small Business Saturday is to check your local listings and see if there are any events going on that you can take part in. Events that bring multiple small businesses together are great for expanding your customer base, introducing new products, and getting old customers excited about purchasing from you again. Customers who are familiar with other companies at the event will be introduced to your products and vice versa. Not only will you get more support for your business, you will be helping other small businesses as well. If there is not an organized Small Business Saturday event, you can look into starting one by contacting venues and other local organizations. Or, you could simply host one at your own store. If you only sell products online, and do not want to set up a booth at an event, you can still participate in a virtual Small Business Saturday by updating your website to reflect the holiday and offer specials to new customers. This is also a great opportunity to try running an ad campaign to boost your marketing efforts. 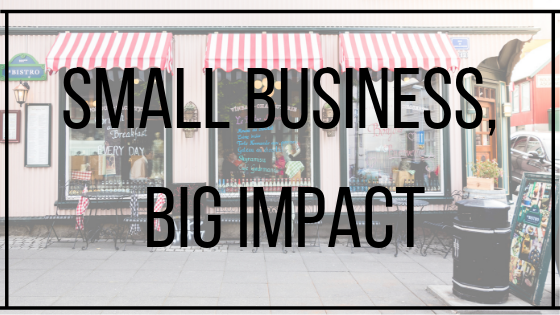 How does Small Business Saturday effect my business and community? Small Business Saturday is wonderful in many ways. Aside from gaining new customers, it is also a great opportunity to form relationships with other local businesses. Even if you do not sell similar products, you can help support one another by displaying business cards, fliers, and even products if you can find a way to incorporate them. If you have a positive relationship with other businesses, they are likely to refer their customers to you if they do not have the product or service they are looking for. This allows businesses of all types to cross over, as the same customer could be looking for a new clothing shop, a restaurant, and a home décor store all in the same day. Additionally, small businesses helps employ members of the community. Small Business Saturday allows the community to form relationships with the businesses as well. Having a personal relationship with customers increases loyalty, as they are visiting for shop of the experience as well as the product. If you sell your products only online, you can still build relationships with other companies and customers by reaching out with personalized notes, and having stellar customer service. While big retailers might seem impossible to beat, with Small Business Saturday rapidly gaining popularity, small businesses can have a very successful holiday season. Even if you are preparing last-minute for this year’s Small Business Saturday, by spending less than an hour creating social media posts and extending your Black Friday sale you will set yourself up for a prosperous season.